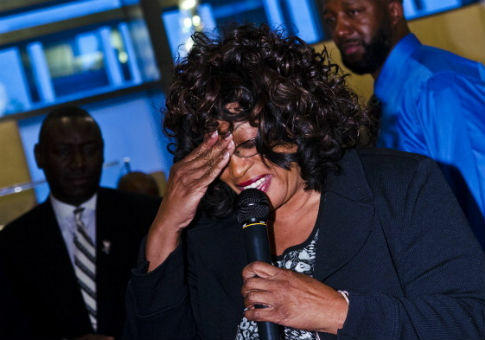 After an emotional hour of questioning, and at least one break for the defendant to recover from crying, former Democratic Rep. Corrine Brown (Fla.) finished testifying in her federal trial for corruption on Friday. Brown's testimony began on Thursday, when she carried on what the Times-Union called "conversational" testimony with defense attorney James W. Smith III. On Friday morning, the prosecution began its cross-examination, starting with questions on alleged fabricated charitable donations on her tax returns. "How some of that got on there, I can't tell you that," Brown said. "Let's be truthful with this. I did not double check my taxes." Brown was also challenged on records showing more than $10,000 in cash deposited into Brown's account between July 2013 and August 2013. "How much money do you think an average person would notice in their bank account that didn't come from their job?" Assistant U.S. Attorney A. Tysen Duva asked. "I don't know, sir," Brown replied. The 12-term congresswoman, who lost reelection last year after being indicted, began crying during her testimony and requested a brief break from the judge. She was being asked about why her former chief of staff, Ronnie Simmons, deposited $3,000 in cash into her bank account. "If he gave me any money, my assumption was that it was his money. Do you think I would do that?" a tearful Brown said. As the jurors exited for the recess, the microphone picked up Brown saying, "They're trying to destroy my life." When Brown retook the stand, she defended $149,000 in cash deposits, arguing they were loans, repayment for loans, official reimbursements, or gifts. She insisted that other cash deposits were from personal sources. "I had birthdays, I had Christmas. Sometimes I had boyfriends," the former congresswoman said. Brown was hostile at times, calling the prosecution's account of her financial history "garbage" and accusing them of trying to force testimony from a major witness. At other times, she appeared unaware of her charitable venture. When asked if she had ever taken a photo with a scholarship recipient from One Door, Brown paused and responded, "I don't know." Brown's trial is expected to go to a jury after closing arguments on Monday.